Read our D11 Retrofit advertorial inside Power Engineering Magazine’s February issue. Read Power Engineering magazine’s full Feb issue online here. Page 32 Steam Turbine Retrofits article & Page 41 MD&A’s D11 Retrofit advertorial. Relative to historical industry experiences, GE® D11 steam turbines have come of age at an early stage in their lifecycle and are strong candidates for retrofit solutions. The most common reasons reported to MD&A for prompting retrofit consideration include (1) reliability issues, (2) technology obsolescence and (3) changes within plant operating missions and steam cycles (e.g. 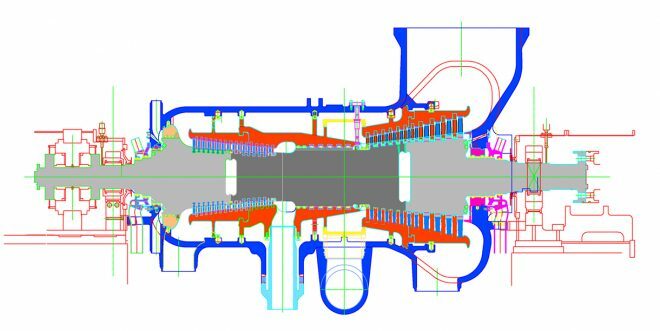 modifications to boiler or combustion turbines from initial design). Commonly, these drivers led to retrofits after 20 to 30+ years of operation. However; the experience of progressive major reliability and operational issues coupled with outdated technology warrants the evaluation of a retrofit solution compared to continuously increasing maintenance costs. In MD&A’s experience, significant mechanical failures, particularly in the High Pressure (HP) and Intermediate Pressure (IP) sections, such as shell and N2 packing head cracking, continue to worsen in both severity of the defects as well as frequency of occurrence. In addition, other reliability issues such as poor vibration characteristics, bowed rotors, and diaphragm dishing further contribute to increasing losses in unit’s thermal performance. The underlying reasons for early maturation of the D11 fleet are varied. Application of low-alloy, single-shell configurations operating at 1050 F is a major factor in the reliability issues of the D11. However; the evolution of operational demands for combined cycle power plants also plays a major role in minimizing life expectancy. Early industry expectations were that combined cycle plants would be primarily base loaded. However; as the industry matured, combined cycle plants were eventually required to be capable of sustained, frequent load cycling, and start/stop operational profiles. By itself frequent cycling can be sufficient cause for early onset mechanical failures. The coupling of operational cycling with single-shell, low-alloy components of the D11 has a multiplying effect. Based on reported feedback, the severity and range of mechanical issues for the D11 fleet continue to progress with time. In circumstances where it is determined that the best approach is to repair and maintain existing turbine hardware Mechanical Dynamics & Analysis (MD&A) offers a full complement of turn-key field services, repairs, and parts. MD&A has a 10-year history of supporting the D11 fleet including such services as weld repair of cracked packing heads, straightening of bowed rotors, diaphragm repairs, installation of advanced sealing packages, and steam valve internal component manufacturing and replacements. MD&A is also recognized as an industry vanguard in the area of fossil steam turbine shell weld repairs for over 20+ years. Additionally, for units that experience progressive reliability issues, spiraling maintenance costs, lost thermal performance, and electrical generation, a 15-20 year life-cycle Cost of Electricity (COE) evaluation suggests a retrofit which, in comparison to continuous maintenance expense, significantly out performs the later on a net present value basis (NPV). Magnitude of NPV spread is primarily dictated by unit/customer specific data. As an example, shell cracking at the main fit ultimately necessitates shell replacement for long term resolution as a weld repair is considered only a temporary solution to return the unit to service. Shell cracking is also common at other locations such as the HP and IP inlet areas. Discovery of shell cracking during maintenance inspections or as a root cause for forced outages results in high repair costs and disruption to the owner’s operations. MD&A, in conjunction with its parent company Mitsubishi Hitachi Power Systems (MHPS), has developed a “Drop-In” retrofit solution for the D11 HP/IP which addresses fleet reliability concerns, providing excellent availability, and enhanced thermal performance. The MD&A/MHPS design was created by leveraging proven steam turbine technologies from MHPS. Given MHPS’ extensive combined cycle fleet experience our design team was able to develop a retrofit solution which maintains plant interfaces. Each retrofit offered by MD&A/MHPS is custom designed and optimized for its unique application and includes replacement of the existing flexible, low alloy shell with a robust, double shell construction utilizing high chrome material within high temperature locations. The new shell facilitates implementation of other improvements such as a larger diameter rotor with excellent vibration characteristics and incorporation of a high efficiency steam path. Similar to the double shell, these components also utilize a robust mechanical design including high chrome material for superior creep characteristics. Inherent with the retrofit, an opportunity exists for re-optimization of the steam bottoming cycle including an increase to duct firing. In situations where plant operating missions are modified, combustion turbines are upgraded, or duct firing profiles are altered, resetting the unit design point can provide the end user with significant value. Design re-optimization can yield major cost saving benefits beyond resolution of reliability and thermal performance deficiencies. Through its services experience and detailed engineering study of the D11 fleet and configuration, MD&A/MHPS have developed an HP/IP “Drop-In” retrofit solution based upon proven steam turbine technology with a projected payback within 2-3 years. For more information, contact MD&A at (518) 399-3616.